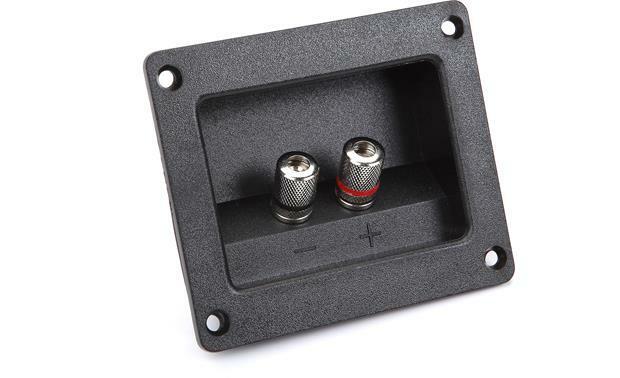 This Metra square terminal cup features binding post terminals that make it easy to connect speaker wire to your speaker or subwoofer box. The pass-through binding posts accept bare wire, spade lugs, and banana plugs. Knobs are color-coded for positive and negative connections. Warranty: 60 days. Built my own subwoofer boxes and used these. Fairly easy to install, works well with banana plugs. On the inside, I recommend using the nut on the inside to secure the wire going to the speaker. Everything is plastic, minus the terminals obviously, which are metal. 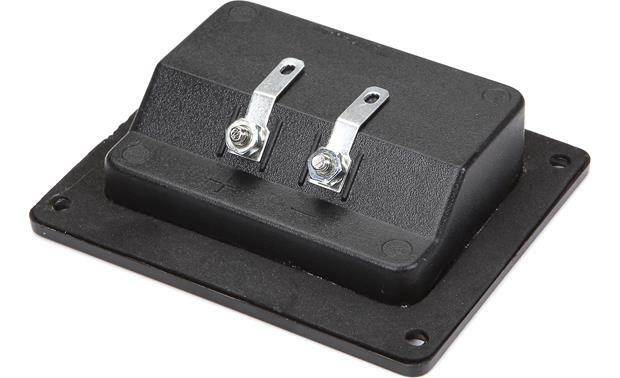 General Overview: This rectangular 5-way binding post terminal cup will accept pin connectors, spade lugs, single and dual banana plugs, and bare wire up to 10 gauge. The posts are color-coded for positive and negative terminals. On the side that connects to the speaker, there are two 0.205" male quick-slides (will accept a 0.205" female quick slide). The wire can also be attached using the nut holding the quick-slides in place. Note: Speaker wire and female quick-slides are needed to connect the terminals to the speakers. Cut-Out Dimensions: The rectangular terminal cup requires a cut-out of 2.915" (wide) x 2.125" (high). It's plastic. Pretty good rigidity though. The terminals themselves are metal. Searches related to the Metra Speaker Terminal Square terminal cup with binding post connectors (for do-it-yourself box builders).